Get ready to take off kneeboarding! Best Chef dessert 2018 Charter Yacht Show!!!!! $35 per dive, per diver, payable aboard to yacht crew. Jonathan is a PADI certified Divemaster and can lead certified divers on dives. Diving is available for up to 6 guests at a time, max 4 dives per week. The crew are happy to handle gear rental, pick-up and return on the guests behalf. Crew will discuss details during preference calls with guests. Gear rental is at the guests´ expense; crew provide individual cost estimates based on the guest´s requirements. For 7 divers or more, the crew can also arrange rendezvous diving with local dive operators. Offer: Yes Dear is offering a $1,000 discount on any charter taking place between November 1st and Dec. 18, 2019. Can not be combined with any other special offer and does not apply to existing bookings. Send us an inquiry to get specific pricing for Yes Dear. As we write this note to you on the second to last day of our week long cruise, we look back on the last 6 days with such unbelievable experiences and memories. Yes Dear is a wonderful platform and you both have a way of bringing her magic to life. The local knowledge you shared, Katie´s unbelievable skills as a chef and first mate, Johnny´s superior Captain skills, and the continuous treats and surprises have given us many memories of the fabulous trip. You both have a way of fulfilling everyone´s wants and needs always bearing smiles on your faces. One of the highlights of our trip was the magical New Year´s Eve celebration in Trellis Bay; party decoration and hats, and outstanding dinner and dessert, going onshore for festivities with you both and the beautiful fireworks right off our transom. The happiness you both carry in your hearths bleeds over to all of us fortunate to be aboard. Our expectations for this trip were far surpassed for this trip because of you both making our every want and desire a reality. We wish you both fair winds and calm seas for many years to come. You compliment each other incredibly well. Thanks for taking such good care of our families!! You made our vacation extra special, thank you guys so much. Thank you both for an incredible week! I cannot thank you enough for this wonderful space you have created here aboard Yes Dear. My friends and I are so thankful to have felt so loved - we rarely get the opportunity to be together and having this time in such a special place meant so much. From incredible meals everyday to kiteboarding adventures in the dinghy, you both enabled so much fun & relaxation. I am so sad to be leaving, but these will be some of my favorite memories. Thank you so much for an unbelievably amazing week on Yes Dear! You both made my time in the BVI fun, easy, and personal. From the first day on board, you have genuinely felt like friends - very much part of our little crew. I especially enjoyed talking to Katie about Christmas recipes and mega yachting, and Johnny wearing a flipper as a hat in a rainstorm or the promise of teaching us to shag dance will be fun to look back on. It was so lovely meeting you and good luck in your many future adventures! We are proud to be Yes Dear´s first charterers under the command of Johnny and Katie. We have chartered a bunch of boats over the years, and Johnny and Katie have made this one of the best times of all! They are energetic, fun, enthusiastic and made us feel right at home every minute. Katie is a master in the galley, creating works of art that are also delicious and healthy. We were so fortunate to have 13 days on Yes Dear and wish we could have stayed longer. The combination of the BVI, Yes Dear, and Johnny & Katie just can´t be beat!! PS Christmas 2018 will be one we talk about for decades to come!! First I would like to say THANK YOU to Fancy, Jonathon and Pedro(black dog!!!) for one of the best days ever!!! The day was absolutely perfect! I was traveling with 3 friends and we wanted to be spoiled for the day and boy were we spoiled!!! From the minute we stepped out of the taxi until we step back onto the dock!!! Fancy and Jonathon really know how to treat their guests. They were so infornative about the area, great drinks(Pedro Punches, YUM), avocado appetizer and seafood boil. Everything was so yummy! The snorkeling spots were great and when I just wanted to take a break from snorkeling I floated behind the boat in a water lounger! They made sure my Pedro Punch was always refreshed. 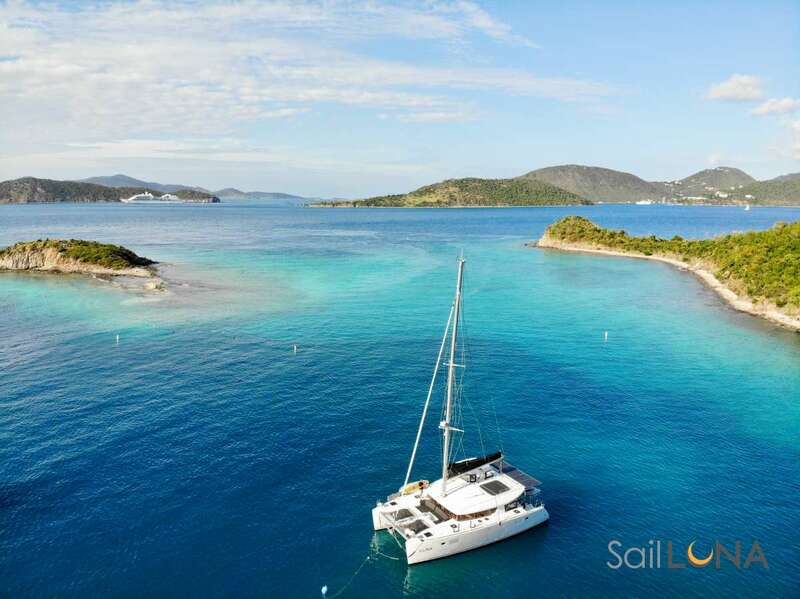 :-) Can´t wait to go back to St. Thomas so I can sail again with Happy Island Charters. We sailed with Fancy and Jonathon and the amazing pirate dog, Pedro and had such a great day! With two teenagers and two senior citizens the brothers could not have been more fabulous! They were accommodating and made sure we had a most wonderful time on board their sailboat! I would highly recommend chartering them for half-day, a full day or more! The pizza place was delicious and a one-of-a-kind T-shirt since it´s not easy to get to it! A Big Thank you goes out to Christopher, Jonathon and Pedro! Keep catching those fish Pedro!